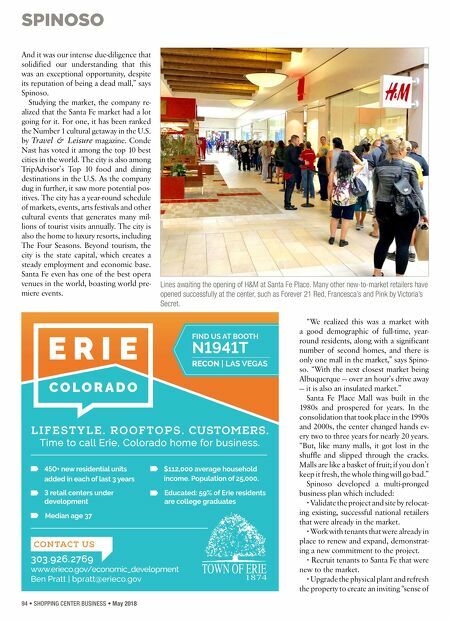 SPINOSO 94 • SHOPPING CENTER BUSINESS • May 2018 And it was our intense due-diligence that solidified our understanding that this was an exceptional opportunity, despite its reputation of being a dead mall," says Spinoso. Studying the market, the company re- alized that the Santa Fe market had a lot going for it. For one, it has been ranked the Number 1 cultural getaway in the U.S. by Travel & Leisure magazine. Conde Nast has voted it among the top 10 best cities in the world. The city is also among TripAdvisor's Top 10 food and dining destinations in the U.S. As the company dug in further, it saw more potential pos- itives. The city has a year-round schedule of markets, events, arts festivals and other cultural events that generates many mil- lions of tourist visits annually. The city is also the home to luxury resorts, including The Four Seasons. Beyond tourism, the city is the state capital, which creates a steady employment and economic base. Santa Fe even has one of the best opera venues in the world, boasting world pre- miere events. "We realized this was a market with a good demographic of full-time, year- round residents, along with a significant number of second homes, and there is only one mall in the market," says Spino- so. "With the next closest market being Albuquerque — over an hour's drive away — it is also an insulated market." Santa Fe Place Mall was built in the 1980s and prospered for years. In the consolidation that took place in the 1990s and 2000s, the center changed hands ev- ery two to three years for nearly 20 years. "But, like many malls, it got lost in the shuffle and slipped through the cracks. Malls are like a basket of fruit; if you don't keep it fresh, the whole thing will go bad." Spinoso developed a multi-pronged business plan which included: • Validate the project and site by relocat- ing existing, successful national retailers that were already in the market. • Work with tenants that were already in place to renew and expand, demonstrat- ing a new commitment to the project. • Recruit tenants to Santa Fe that were new to the market. • Upgrade the physical plant and refresh the property to create an inviting "sense of Lines awaiting the opening of H&M at Santa Fe Place. 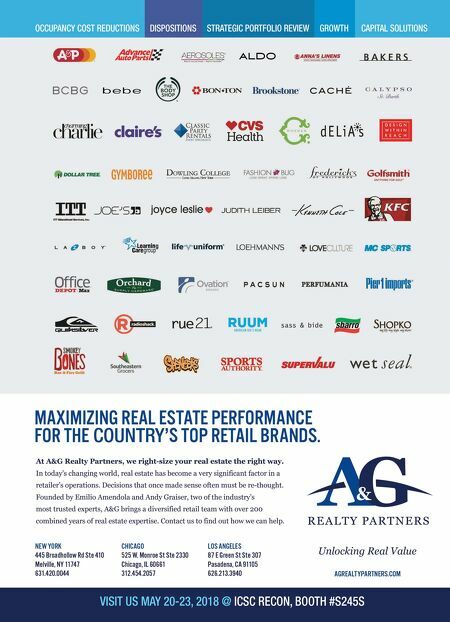 Many other new-to-market retailers have opened successfully at the center, such as Forever 21 Red, Francesca's and Pink by Victoria's Secret.